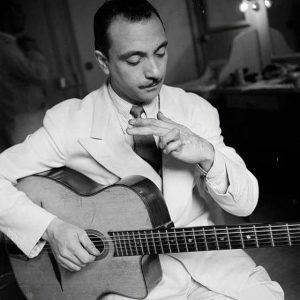 Did the famous Django Reinhardt ever play in the Denmark? Yes, actually Django did visit Copenhagen in Denmark on his Scandinavian tour in 1939 just before the outbreak of the 2nd world war. Together with The Quintette du Hot Club de France he played two double concerts in Copenhagen at the Odd Fellow Theatre on February 6th and 11th. The line-up was: Django on guitar, Stephane Grappelli on violin, Joseph Reinhardt & Pierre Ferret on rhythm guitars and Eugene d’Hellemmes on bass. A special feature was the young singer Beryl Davis who also performed with the Quintette in Norway February 8th in Oslo at Gamle Logen and in Stockholm at the blue Concert Hall. All four concerts in Copenhagen was well received by an enthusiastic crowd and got great reviews in the Danish newspapers. You can read the reviews here and see a picture of Django at the Odd Fellow Concert Hall from the newspaper Berlingske Tidende. At this page you can read more about Django and his musical life. The excerpt is taken from Jens Fuglsangs thesis on Django Reinhardt’s life and music from Copenhagen University, 1999. You can also read more about the contemporary Gypsy Jazz and the legacy of Django in Jens Fuglsang’s 2 articles from the Danish Jazz Magazine Jazz Special #71 and Jazz Special #113. Jean Baptiste Reinhardt, who was born in a gypsy caravan in 1910, became one of the most significant and original guitarists in jazz history. Although born in Belgium he lived most of his life in France, where he was known by his stage name, Django Reinhardt. In Paris in the 1930’s, Django was the first european musician to arouse the interest of american musicians in the european jazz scene. He achieved this through his creative and original musical ability, immortalised in the 854 recordings he managed to produce between 1928-1953. With his virtuosity and unorthodox 2-fingered playing technique, Django was, together with Charlie Christian, one of the pioneers of modern jazz guitar. He also contributed to the consolidation of the jazz guitar as a solo instrument, in contrast to itís conventional role in the rythm section of the old jazz bands. In his career Django played and recorded with many prominent, ground breaking musicians such as Duke Ellington, Louis Armstrong, Coleman Hawkins and Eddie South. 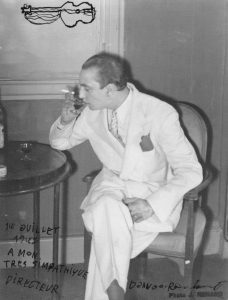 In contrast to other jazz pioneers, Django was European and, first and foremost, a gypsy, which played a major role in both his musical development and his lifestyle. His most famous musical partnership was with the french violinist Stéphane Grappelli in their swing band “Quintette du Hot Club de France” consisting entirely of string instruments, an arrangement that spawned the musical genre “gypsy jazz” or “jazz manouche”. Django enthusiasts differ greatly in their opinion as to which period was the best. The two first are especially interesting as it is here that gypsy jazz was created. 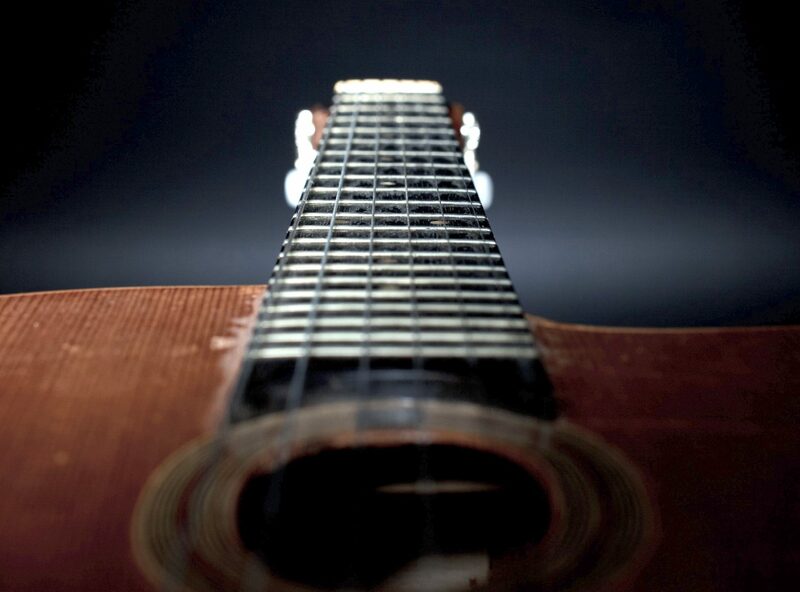 Of course many of the guitar techniques that Django introduced, for example the chromatic glissando, note bending, octaves, trills and sweeps, were old techniques that had developed through the centuries within classical, flamenco and folk music. However, Django’s implementation of these techniques into improvised jazz solos was completely new. It is also in these two periods where Django’s gypsy roots are most in evidence which is why this is usually considered to be Django’s “golden age”. In the third period starting around 1940, the popularity of swing music was established, and we see a new side of Django. It was his role as composer, big band arranger and solo virtuoso that showed the breadth of his musical understanding way beyond the jazz framework. In this period Django’s style became more sophisticated, and much of the time he seemed more interested in composing and conducting than in playing the guitar. Despite the difficulties presented by the 2nd world war there are many fine big band recordings, especially from Belgium, where one can here Django playing his own compositions and arrangements. In the last part of his musical journey, Django moved away from the gypsy genre and over to be-bop, which he encountered on his USA tour in late 1946. He arrived in the states as “the king of swing-guitar”, but he found that jazz had developed a great deal in comparison to war-torn Europe. In the small New York clubs, swing was slowly giving way to the new style of be-bop and Django began to see himself as a representative of a past era. This was hard for Django to take, having always been at the forefront of the european jazz scene, and he reacted by becoming increasingly reclusive, spending more time painting than playing the guitar. In his last years from 1951-53 he once again transformed his style and re-incarnated himself as a be-bop guitarist. He put a Stimmer pick-up on his old macaferri, dropping the electric guitar which heíd been using since the USA tour and he began to tour with a new generation of jazz musicians. Sadly, Django died in 1953 aged only 43, so he was never able to enjoy his second youth, but in the be-bop recordings which he made, one can hear that he fully succeeded in making the transition. 2) Djangology series 1-10 from EMI/Pathe Marconi covers the whole period of Django’s career but a lot of material is edited out. On the web site www.djangostation.com you can find discography of all Django’s recordings. This site also has lots of articles, links and other information about Django and Gypsy Jazz generally. 3) The book “Django – The Life and Music of a Gypsy Legend” by Michael Dregni is one of the best and most critical biographies about Django. Together with Charles Delauney’s book “Django Reinhardt” they cover most of Django’s life and music from childhood to his death. 4) If you’re interested in the heritage of Djangos music from the 1950’s until today then check out guitarist Jon Larsens label Hot Club Records who released more than 600 records, films and books about contemporary Gypsy Jazz. (c) The excerpt on Django Reinhardt is taken from Jens Fuglsangs thesis on Django Reinhardt’s life and music from Copenhagen University, 1999. Photos by Nicolai Perjesi, Top logo by Per Toftager, Guitar logo by Ingrid Pilgaard. Web design by Frederikke Fuglsang & Rêve Bohème.